Periodic Review Boards - Welcome to "Close Guantánamo"
12 of the Guantanamo prisoners put forward for Periodic Review Boards. 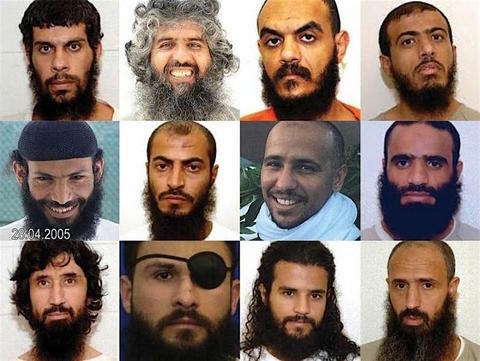 Top row from left: Mohammed Ghanem (Yemen, freed), Haji Hamidullah (Afghanistan, freed), Abdul Rahman Shalabi (Saudi Arabia, freed), Ayyub Ali Salih (Yemen, freed). Middle Row​: Yassin Qasim (Yemen, freed), Abdu Ali al-Hajj Sharqawi (Yemen, approved for ongoing imprisonment), Mohamedou Ould Slahi (Mauritania, freed), Mansoor al-Zahari aka al-Dayfi (Yemen, freed). Bottom, from left, Ravil Mingazov (Russia, freed), Abu Zubaydah (Palestine, approved for ongoing imprisonment), Salman Rabei’i (Yemen, freed), Abdul Latif Nasir (Morocco, approved for release but still held). This is the first comprehensive annotated list of all the Guantánamo prisoners eligible to take part in Periodic Review Boards, a process established in 2013 to review the cases of 71 men -- 46 designated for ongoing imprisonment without charge or trial by the high-level, inter-agency Guantánamo Review Task Force that President Obama established shortly after taking office in 2009 (which issued its final report in January 2010), and 25 others recommended for prosecution by the task force, until the basis for prosecuting them -- generally, charges of providing material support for terrorism -- were struck down by the appeals court in Washington D.C. in two particular rulings in October 2012 and January 2013. The task force's recommendations that 46 men should continue to be held without charge or trial were contentious, of course, because the decisions were made on the basis that the men in question were "too dangerous to release," but insufficient evidence existed to put them on trial. What that meant in reality was that the task force had accepted information obtained through torture or other forms of abuse, or multiple layers of hearsay, all of which is profoundly unreliable. When President Obama accepted the recommendations and issued an executive order in March 2011 approving the men's ongoing imprisonment without charge or trial, he only avoided damning criticism from NGOs and lawyers by promising periodic reviews for the men, who were later dubbed "forever prisoners" by the media. Although President Obama's executive order promised that all initial reviews would take place "no later than 1 year from the date of this order," the first PRB -- featuring representatives of the Departments of State, Defense, Justice and Homeland Security, as well as the office of the Director of National Intelligence and the Office of the Joint Chiefs of Staff -- did not take place until November 20, 2013. Since that delayed start, however, all the prisoners' cases were finally reviewed, as of September 8, 2016. Of the 64 men reviewed, 38 were recommended for release, and 26 were recommended for ongoing imprisonment. Seven of those whose releases were approved had those decisions taken after second reviews. This was positive news for the prisoners involved, representing a 59% success rate, and as President Obama left office in January 2017 all but two of those approved for release had been freed. Of the 71 men originally listed as being eligible for PRBs, seven were removed from consideration. Five Afghans -- mostly Taliban leaders, and all described by the task force as "too dangerous to release" -- were freed in a prisoner swap for US PoW Bowe Bergdahl in May 2014 -- Abdul Haq Wasiq (ISN 004), Mullah Norullah Noori (ISN 006), Mullah Mohammed Fazl (ISN 007), Khairullah Said Wali Khairkhwa (ISN 579) and Mohammad Nabi Omari (ISN 832), and two others -- both initially recommended for prosecution -- were included in developments in the military commissions: Ahmed al-Darbi (ISN 768), a Saudi who accepted a plea deal in February 2014, and Nashwan Abd al-Razzaq Abd al-Baqi (aka Abd al-Hadi al-Iraqi) (ISN 10026), who was put forward for a trial in June 2013. The removal of these seven from consideration left 64 men eligible for PRBs -- 41 regarded as "too dangerous to release," and 23 initially recommended for prosecution. Below, the 64 men who had PRBs are listed, in the first full PRB list to be made available anywhere -- since the original PRB list was made available through FOIA legislation in February 2014. This was then cross-referenced with the Guantánamo Review Task Force's "Final Deliberations," which were made public in June 2013. Also included are links to all our articles about their cases. Also see the PRB website for links to the reviews that have already taken place, and those scheduled to take place. There are a number of relevant pages -- initial reviews, full reviews, which reassess those cases in which the prisoners were approved for ongoing imprisonment, and, like the initial reviews, allow the prisoners to speak to the board by video link, and file reviews, which are purely administrative, and which, as the authorities state, "will be conducted for any detainee whom the PRB has determined that continued detention is necessary every six months in between full reviews, and will focus on any new information or changed circumstances that the PRB should consider." We are watching Donald Trump closely, but sadly have to conclude that, although he resisted calls from some Republican Senators to scrap the PRBs, they have become toothless under his watch, as no one has been approved for release since he took office. For further information, see Guantánamo’s Periodic Review Boards: Eight Men Entombed by Donald Trump.